The ChemiDoc MP is an instrument for imaging and analyzing gels and Western blots. It is designed to address multiplex fluorescent western blotting (up to three simultaneously), chemiluminescence detection, general gel documentation applications, and stain-free technology imaging. In fluorescence, also far red and near infrared dyes can be used. It has automatic selection of optimal light source by application, auto focus, auto exposure, and preview features to ensure optimal images. The instrument is operated via a touch screen. 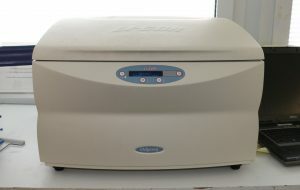 The BioRad ChemiDoc MP gel analysis instrument is suitable for chemiluminescence, fluorescence (green and red emission) and intensity measurements. Data acquisition as well as lane and band analysis are performed with the ImageLab software. Offline version of the software is available from the CIC. The manual for the software is available here. Location: Turku Centre for Biotechnology, room 5062. 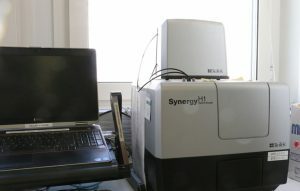 Synergy H1 is a flexible monochromator-based multi-mode microplate reader that can be turned into a high-performance patented Hybrid system with the addition of a filter-based optical module. The monochromator optics uses a third generation quadruple grating design that allows working at any excitation or emission wavelength with a 1 nm step. This system supports top and bottom fluorescence intensity, UV-visible absorbance and high performance luminescence detection. It is the ideal system for all the standard microplate applications found in life science research laboratories. Location: Turku Centre for Biotechnology, room 5130 (Abankwa lab). The Odyssey gel analyzer allows the user to detect strong and weak signals over a broad linear dynamic range. The near-infrared fluorescence provides sensitivity equal or better than chemiluminescence. Location: Turku Centre for Biotechnology, room 5060.